As they continue to work their way towards the final 53-man roster, the Steelers released 10 players on Friday afternoon. The list of now-former Steelers includes no surprises. Among those departing: TE Sean McHugh, DT Scott Paxson, RB Justin Vincent, TE Eugene Bright, G Dorian Brooks, OT Kyle Jolly, WR Brandon London, LS Matt Stewart, S Justin Thornton and LB Renauld Williams. McHugh and Paxson both won rings with the team in Super Bowl 43 two seasons ago. In addition to those moves, the team has reportedly allowed veteran OL Justin Hartwig to seek a trade, signaling the pending end to his time as a Steeler. 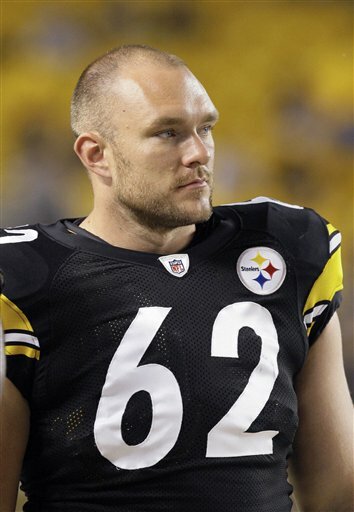 Hartwig was demoted to a backup role with the emergence of rookie Maurkice Pouncey, and has a contract worth over $2 million for 2010. Expect him to be playing elsewhere, either by trade or via release/sign, by opening day. The Steelers still have to cut 11 players by the NFL's deadline of 6 p.m. on Saturday night. Those seated on the hot seat more than likely include OL Kraig Urbik, KR Stefan Logan, LB Patrick Bailey, DL Sunny Harris, WR Tyler Grisham, RB Frank Summers, DB Joe Burnett, DB Anthony Madison, RB Jon Dwyer, and DE Doug Worthington, among others. There may be a few minor surprises, but I'm not anticipating anything too far out of left field. From what I read on steelers.com, Urbik's agent had posted on his twitter that he was cut. Not to nitpick or anything, but the dude's name is Sonny Harris. But Tyler Grisham runs great routes!